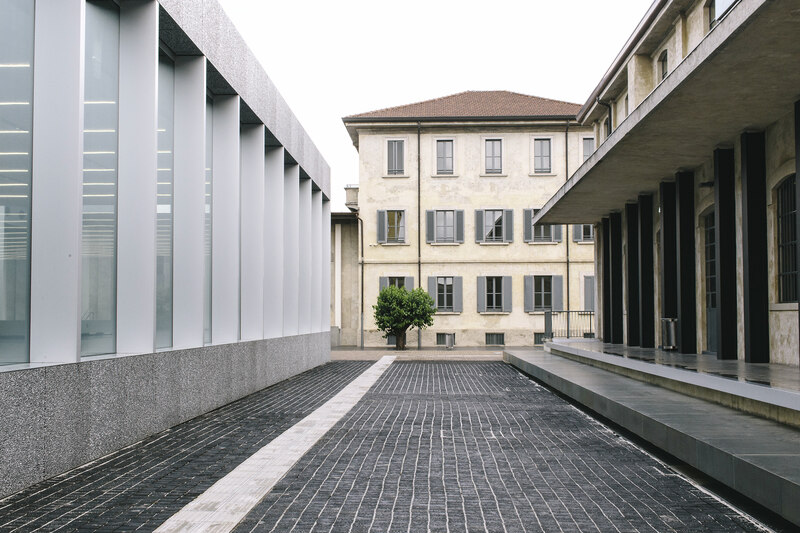 The Fondazione Prada, an institution dedicated to contemporary art and culture, stretches the boundaries of what a museum can (and should) be. Should you find yourself in Milan, even for a day, there are few more worthwhile places to spend your hours. 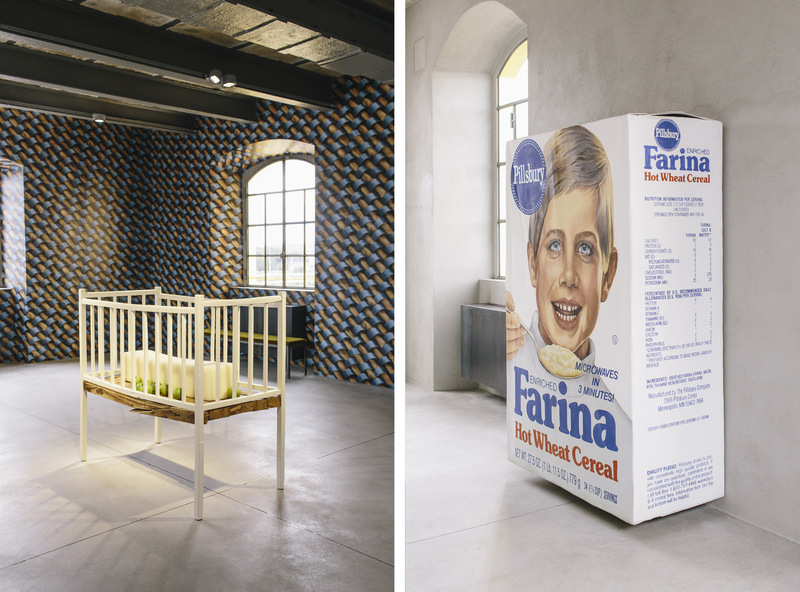 Fondazione Prada left me broken and healed. One lengthy afternoon wandering amidst its diverse exhibits left me with both questions and answers; breathless and yet full of life. Each building, each corner, each wall, each turn brought a welcome surprise. And as I walked out of the last building from the pitch black, with sand in my shoes, into the brightest sunlight, I held onto the railing and wiped away tears from my eyes. 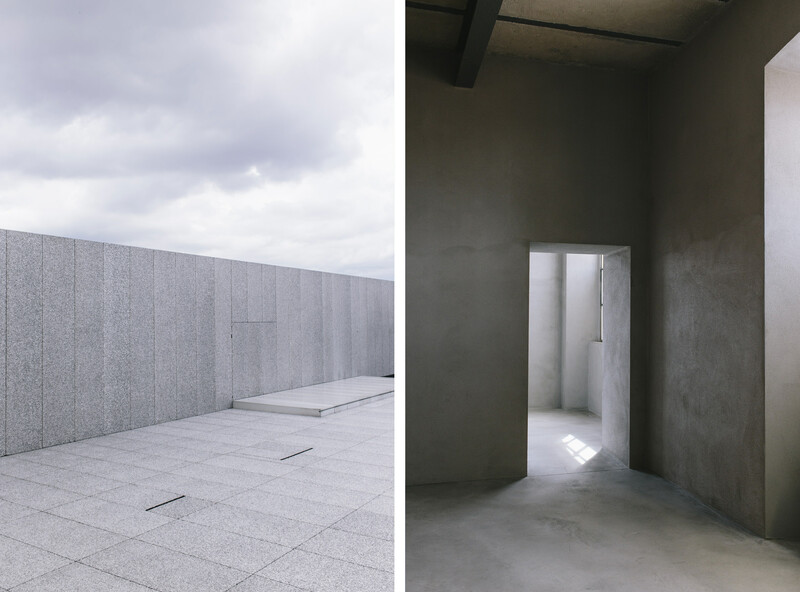 The grounds of Fondazione Prada were architected by OMA, led by Rem Koolhaus. The result is an experience of freedom and continuation that I haven’t experienced in any other gallery or museum. 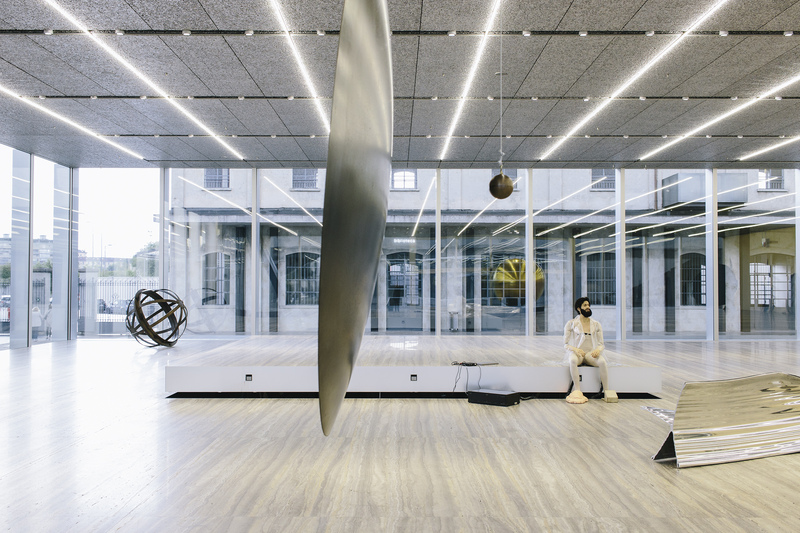 As explained by the architect, Fondazione Prada “expands the repertoire of spatial typologies in which art can be exhibited and shared with the public.” Once a distillery, the venue has been transformed to include seven buildings with three new structures in the works. As you enter the metal gates of the museum, to your left is a long rectangular building outlined with metal steps and seamless glass railings. The ground is made of dark wood circles, filled at the seems with bright white pebbles. 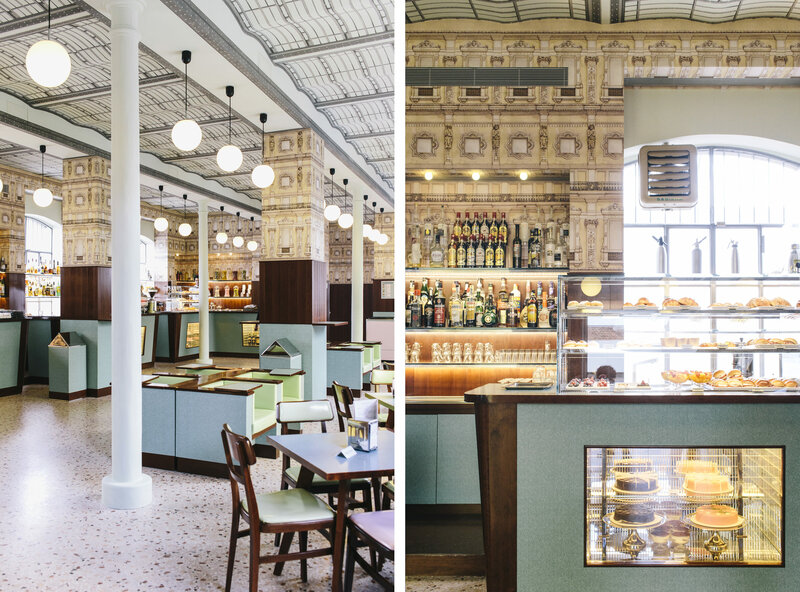 The collection of structures begins with Bar Luce, designed by iconic film director Wes Anderson. Upon entering, I was greeted by an ever multiplying array of tuxedoed Italians, ready with warm smiles and perfectly crafted cups of espresso. Wes Anderson spared no detail in his design, from the symmetrical pastry cases and dollhouse-style furniture (replete with rotating table tops), to two Anderson movie pinball machines. Around the corner, the design details continued, inviting you down a staircase to continue your exploration. Next, I entered the Haunted House, which is said to be haunted currently by the bewitching mind of Robert Gober. The first floor begins with a look into a messy room of clothes and drawers and furniture strewn about. Wandering from room to room reveals body parts in different forms, jutting from walls and coiled on the floor. Climbing higher reveals doors to nowhere, a crib with a block of wax surrounded by apples, and at the very end, a grate in the floor with running water and a bright red shimmering heart. Building 5, titled Goshka Macuga: To the Son of Man Who Ate the Scroll, hosts a multitude of fascinating objects both new and old from various international artists. In the expanding, naturally lit room sits a large golden ball, a long silver bench that appears like it’s melting, an oversized gong, a swinging mass of metal that looks like matted hair, and in the middle of it all, a broad, short stage where a robot sits dressed in a splayed out clear latex overcoat. He sits with two profuse masses attached to his feet and talks of humanity, the mind, and the future. It’s a collection of prose from authors and speakers so captivating that, as he speaks from his robotic but human-like mouth, I have to keep reminding myself that he (it?) is not actually human. L’image Volee (The Stolen Image) exhibit, curated by the artist Thomas Demand is based on the concept that “everyone stands on someone else’s shoulders” (Demand). 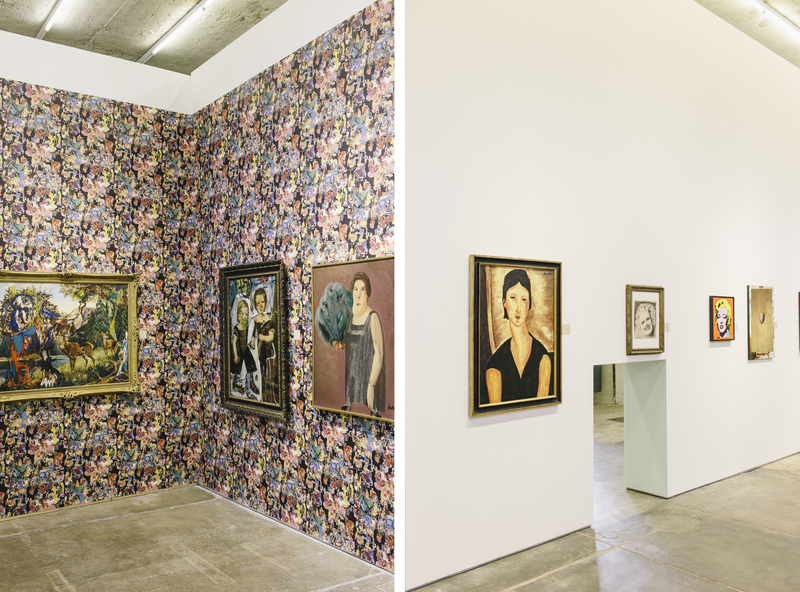 It explores the concept in three ways, Literally Stealing, Iconographic Poaching, and Pictures That Steal. Executed in various forms and mediums (including pictures, objects, and videos), each piece stands alone. But the collective impact of the curation left me looking at art — and particularly pop culture — through a new lens. Fondazione Prada is committed to funding research projects that inform and integrate into the creation of the works there. One of the more visually interesting representations of this is the exhibition “To the Son of Man Who Ate the Scroll” by Goshaka Macuga. 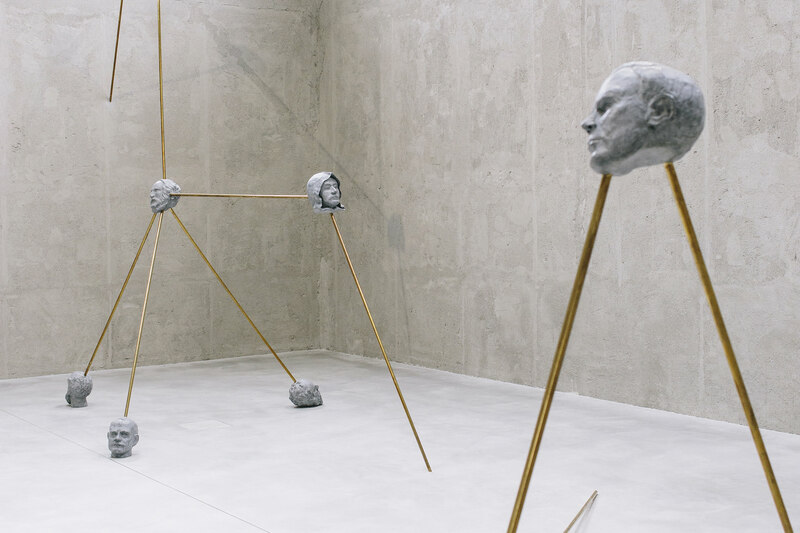 After extensive research, the artist linked together 73 bronze heads from great minds from ancient times, including Einstein and Freud, to more contemporary figures like Martin Luther King. Connected by bronze poles, each structure of heads varies in size, form, and visual dimension. As explained via a placard on the far wall, “this work can be seen as a realization of an imaginary encounter between thinkers of different historical periods and geographical and cultural backgrounds, whose ideas reflect on the complexities of human nature and history.” In other words: layers upon layers of genius. I wandered through a few other exhibits, taking in each theme and falling deeper down the rabbit hole. And just when I thought I had experienced about as many heart palpitating moments as possible, I entered the final building. Within it was an exhibit demonstrating Kienholz’ conceptual perspective of sexuality, particularly deviant sexual expressions as portrayed through dolls, carnival themed immersive experiences, life size figures was both alarming and painful to witness. The exhibition ebbs and flows with scenes that make your stomach turn, from a large wall full of small portraits of Jesus, to a final room that takes you into The Five Car Stud, a ghoulish scene taking place in a dark, dirt and sand cover the floor. 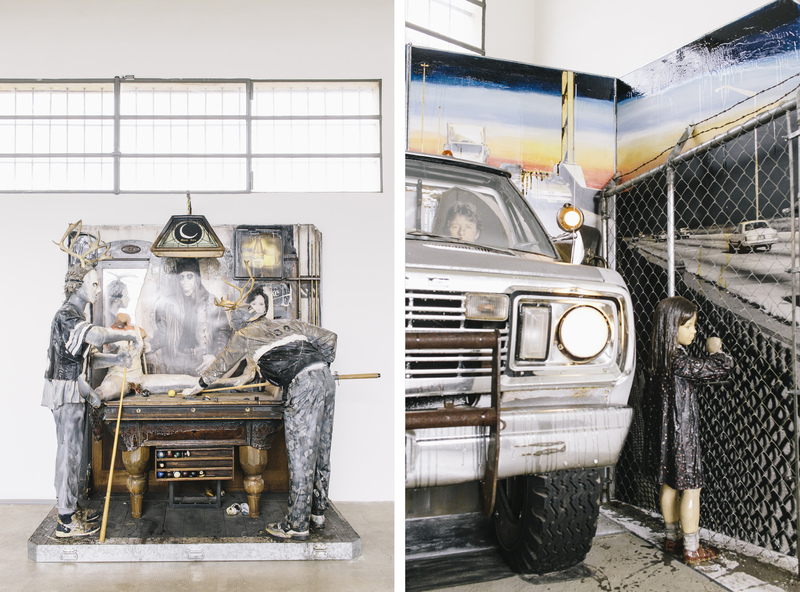 It’s Kienholz most imposing work in terms of commitment to civil rights. It’s a scene of nightmare and crime, lit by headlights of old cars playing folk songs. In the center, five white men in masks have attacked and surrounded a black man who lays pinned to the earth, his fate certain. Kienholz skewed his face so one part is sadly resigned and the other filled with terror. Words don’t do this work justice. Kienholz raw display of a single event such as this is a brave portrayal of racism. A moment in recent history that is still relevant in today’s tumultuous climate, which is just one reason why it was so moving. Seeking artistic experiences is one of the greatest opportunities we have to expand our minds while peeking, or diving into the conscious and subconscious of an artist. Art communicates, evokes, mesmerizes, reveals, and showcases, tapping into our psyche to elicit some reaction. It’s this feeling I seek In each city I travel to and if I’m fortunate, I leave forever changed by the art I sought. I sat in the courtyard waiting for the Italian sun and breeze to bring me back to life and forever swirl around the mind-altering experience that is Fondazione Prada.